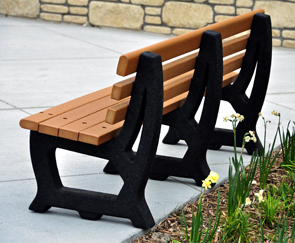 The Brooklyn recycled plastic outdoor bench features arched style frames that form a peaceful and inviting impression. The recycled plastic planks are virtually maintenance-free - they do not need to be sealed, painted or stained. UV protection ensures they will stay beautiful, much longer than wood. Pens and markers can easily be washed off, and paint will not bond to the surface and can be removed with sandpaper. Surface cuts or scratches can simply be ironed away. Post-consumer waste such as milk jugs, pop bottles, and plastic bags are the main ingredients in these benches, and to top it all off, the benches themselves are also recyclable. Help reduce the pollution of landfills with benches that can be enjoyed for generations to come. Available in 4' and 6' lengths. Constructed of seven 2" x 4" Resinwood slats and black recycled plastic bases. 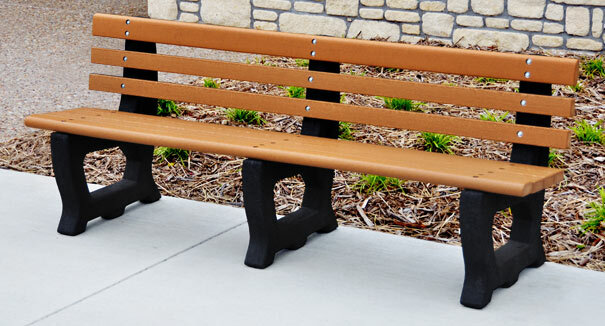 The sheer weight of the benches could serve as a theft deterrent, but optional in-ground mount and surface mount kits are available for securing to any surface such as concrete or dirt.